So many two drops, every single opening had I drew had at least two. 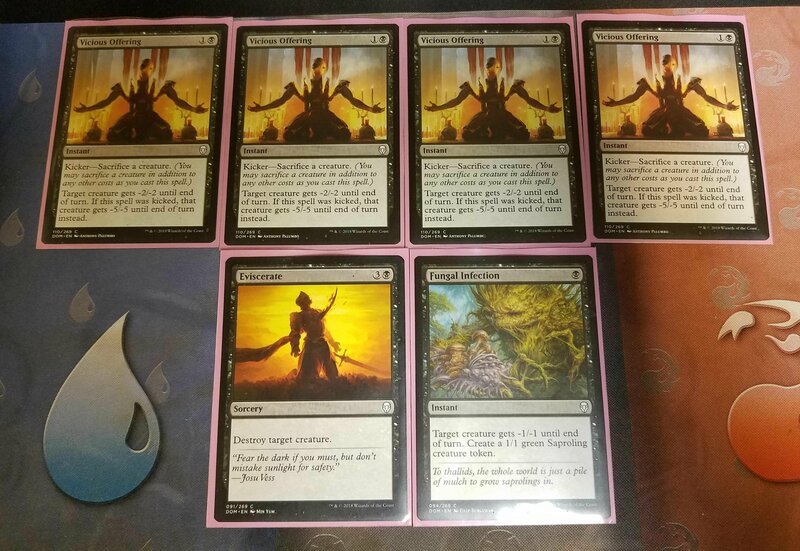 The most expensive cards I played were four drops. I never got mana screwed. The slpit of colors was perfect. I never missed out on getting both colors in play. The tempo was the best out of any deck I’ve ran in a long time. Not many one drops, so most games were like this (turn one land. Turn two land and two drop, turn 3 land and three drop, turn four land and 3-4 drop…). No one could keep up. 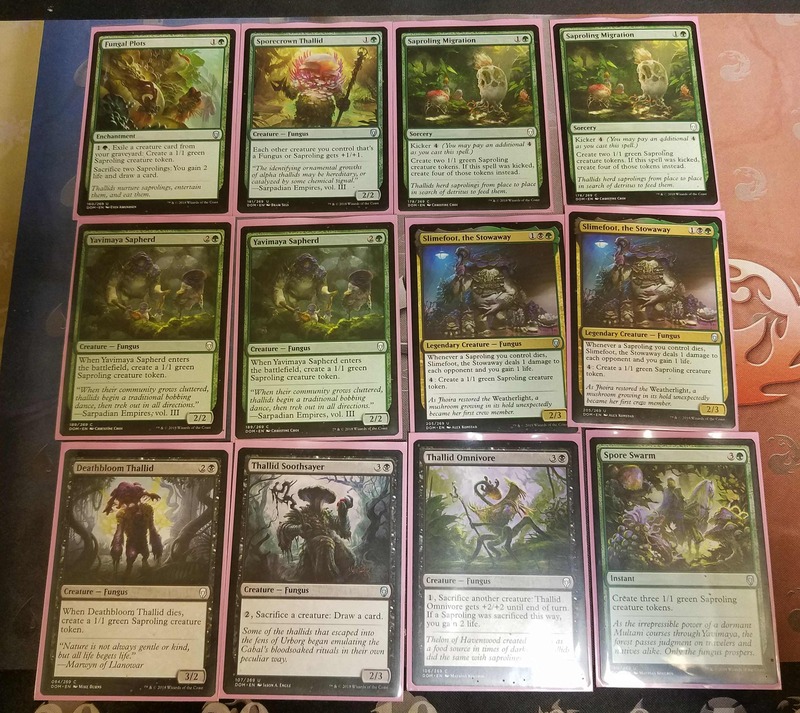 Look at all these fungus/saproling cards! I have never seen a Slimefoot even passed to me before this draft, I ended up with two! I got all of the uncommon fungus, the only thing missing was an extra Fungus lord. The Fungal plots looks like a dead card, but I would suggest 1 in every fungus deck in draft if possible. Late game it gives you extra possbilities that may swing the game. With a slimefoot in play, I used a Fungal plot to do an extra 2 damage that won me the game that the opponent couldn’t do anything about. Now look at this removal! I ended up with 4 viscious offerings! This card is premium removal in my eyes. It kills many 1-3 drops in the limited world. -2/-2 makes you win combat like a trick, and outright kills many rares that have first strike or other obnoxious abilities. If you have a saproling to sacrafice it does -5/-5!!! This kills serra angels (which I did). This much kills almost everything in limited. Having four guarenteed I saw at least 1-2 each game. Here are the extra mentions I pulled. Nothing of great value. I did not rare draft at all in this game night. 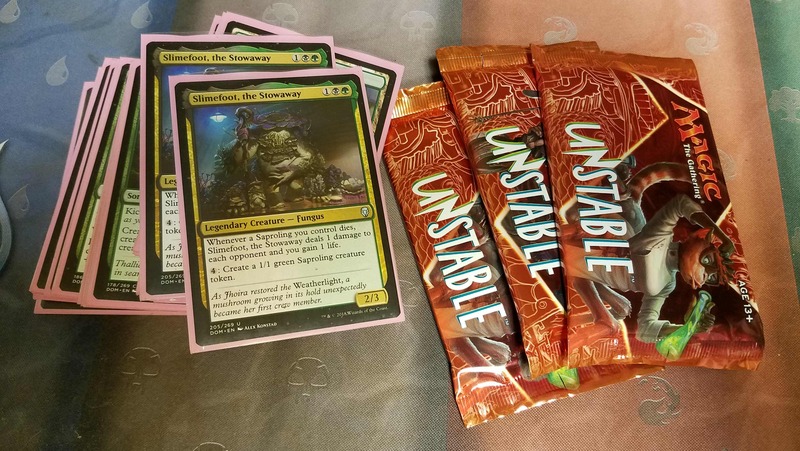 I was super focused to make the best fungus deck I could and picked fungus commons over $1-2 cards. 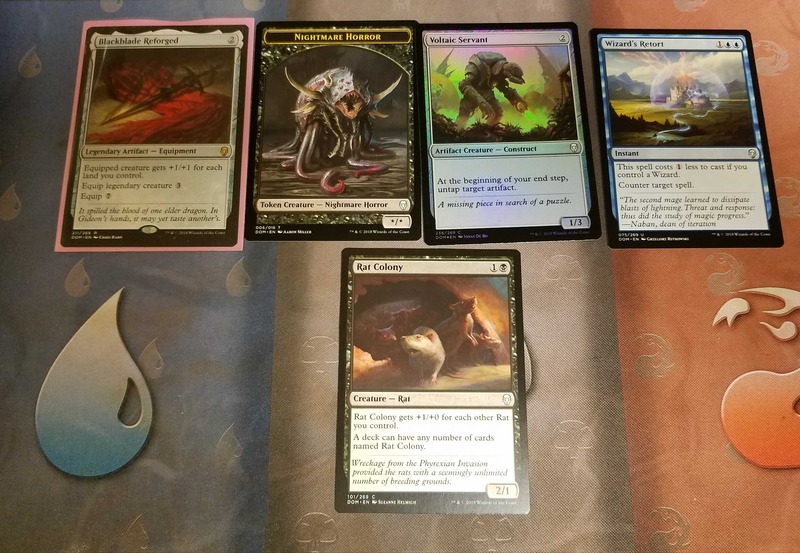 I still managed to get a rat colony and a rare or two, plus a foil. It wasn’t a complete loss. 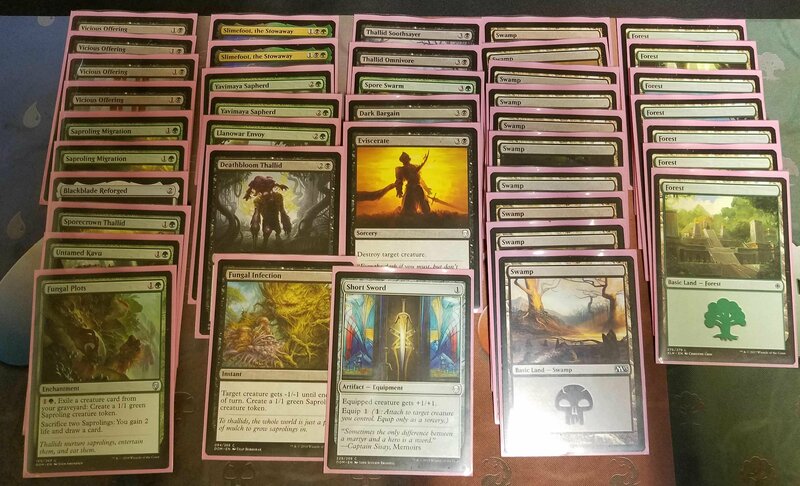 Overall, I think this deck was one of the best I have ever made. I would go as far to say that it would be semi-competitive in standard. I could have brought this deck with a couple more commons and uncommons from my chuck bin and done well in a tournament. I wouldn’t pay anything to run this deck, maybe a free night. Saproling are a great archetype to run on draft night, I haven’t gone wrong going this route in Dominaria. I hope you liked looking at this deck. I had a ton of fun playing/building it. More to come soon! More of Chris-chan’s Pokemon Cards listed!